This article is a short summary of Fire Emblem Echoes: Shadows of Valentia. Fire Emblem Echoes: Shadows of Valentia is a Nintendo 3DS remake of the 1992 Famicom title Fire Emblem Gaiden. The game was released in Japan in April 2017, and worldwide in May, making this the first time that Fire Emblem Gaiden has seen an international release. The game launched alongside of pair of amiibo figures of protagonists Alm and Celica. In Japan, two special edition versions of the game were also released at launch. The "Limited Edition" version includes a Fire Emblem 0 card depicting Alm, a download code to unlock special add-on content, and a soundtrack CD including songs from the original Fire Emblem Gaiden and their remastered versions in Fire Emblem Echoes. The "Valentia Complete" edition also includes an art book, a Fire Emblem 0 Celica card, and the "Fire Emblem HD Movie Collection", a Blu-ray compilation of CG cutscenes used in this game and previous Fire Emblem games. In North America, a singular Limited Edition version of the game was released, which includes a hardcover "Valentia Artbook", the "Fire Emblem Echoes: Shadows of Valentia Sound Selection CD", and a pin set depicting the battlefield sprites for Alm, Celica, and Marth. The game case also features a reversible cover based on the box art for the original Fire Emblem Gaiden. The European Limited Edition includes all of the contents of the North American release, as well as the Alm and Celica amiibo. In 1992, the second game in the Fire Emblem series, Fire Emblem Gaiden, launched exclusively in Japan. Now, for the first time, fans outside of Japan will get a taste of this classic game on the Nintendo 3DS family of systems. Fire Emblem Echoes: Shadows of Valentia is inspired by the 1992 original, reimagined on a grander scale. Every aspect of the Fire Emblem Gaiden game's presentation has been updated, along with the game being fully voiced. Fire Emblem Echoes: Shadows of Valentia recreates classic Fire Emblem gameplay with a modern twist, mixing in exploration of dungeons crawling with enemies. In Valentia, battle is waged in the traditions of elder Fire Emblem™ games, when the rules of battle were simpler, yet the challenge formidable as ever. To stop the war and unify the continent, you'll have to balance the needs of an army of soldiers with unique stats. Play as iconic Fire Emblem character classes, such as Mage, Paladin, and Archer as you bring strategic skills to bear in the challenging grid-based battle system. When you encounter a dungeon on the world map, explore every corner in action-adventure style. You never know what secrets you may unearth. Fire Emblem Echoes recreates the gameplay of Fire Emblem Gaiden using the engine of Fire Emblem Awakening and Fire Emblem Fates. Dungeon exploration is set in a full 3D environment, while enemy encounters use the standard tactical gameplay. From the world map, players are able to visit towns to talk to people and obtain items by observing the world, enter dungeons, and enter battle with enemy forces. The game once again features the Classic and Casual gameplay settings. Strategy gameplay remains similar to previous titles. The Pair Up feature from Fire Emblem Awakening and Fire Emblem Fates is notably absent from this installment, and while certain units are able to support each other to increase stats in battle, other support features such as Dual Attack and Dual Guard have also been removed. The weapon triangle system is also absent for this title. Like in the original, weapons do not break after a certain number of uses while affecting the character's stats in certain ways, and grant the equipped character certain Arts that they can use use in battle; Arts are unlocked as the character continues to use the weapon, but are only usable as long as that weapon is equipped. Terrain effects are present in this title which impact the combat abilities of units, though magic attacks ignore these effects. A feature new to this game is Mila's Turnwheel, which can be used during battle to rewind moves, but can only be used a limited number of times per battle. Units are able to be promoted to advanced classes at Mila Shrines. Fire Emblem Echoes is compatible with certain amiibo, also accessible through Mila's Turnwheel. Scanning the Alm and Celica amiibo on the world map allows the player to access special dungeons. In addition to this, Alm and Celica's stats can be saved onto their respective amiibo, which can then be used during battle to summon a special unit with those stats for one turn. In addition, scanning the amiibo for Ike, Marth, Corrin, Roy, Robin, or Lucina summons a phantom of that character that can assist the player. Fire Emblem Echoes: Shadows of Valentia was first announced during the January 18 Fire Emblem Direct. Planning for a new Fire Emblem title had begun in 2015, following the completion of Fire Emblem Fates, as much of the Intelligent Systems staff wanted to create a new Nintendo 3DS game incorporating elements that they could not in Fates. While series producer Hitoshi Yamagami had begun thinking about a new entry for the upcoming Nintendo Switch console, it was too early for them to start developing a game for the system, so the staff began thinking of ideas that could be created in such a short time. A number of Intelligent Systems staff suggested a remake of Fire Emblem Gaiden, as it would allow them to implement features such as dungeons and free-roaming, as well as the fact that the game's 25th anniversary was approaching and the original game had never been released outside of Japan. The staff had invited the director of the previous games, Genki Yokota of Nintendo, to return for this game, but because he was busy at the time, they instead chose Nintendo's Kenta Nakanishi to be the game's director, due to his strong emotional attachment to the original two Fire Emblem games. When development fully started, Yamagami had originally planned to have the game finished within one year and released in September 2016 (before the launch of the Nintendo Switch), but it was delayed to ensure player satisfaction. According to Yamagami, the goal for this installment was to make newer fans of the series since Awakening aware of the older titles. When deciding on a name for the remake, the team was told by Nakanishi to not use the name "New Gaiden" in order to prevent confusion, as subsequent entries following Gaiden use the term to refer to side chapters. His specific goal for the name was to communicate that the game was a spin-off title without using the word "gaiden". A number of possible titles were suggested to emphasize the game's remake status, such as adding "Re:" to the title, calling the game "再度" (saido, lit. "once again/2nd time", a suggestion by foreign staff), or simply using a capital "G". The team wanted to use an English word for the title so that it could be used worldwide, and settled on "Echoes", as "older games could now “echo” to the modern players." The animated cutscenes were done by Studio Khara. Like Fire Emblem: Shadow Dragon and Fire Emblem Awakening before it, 8-4 handled the game's translation and localization. Famitsu gave Fire Emblem Echoes a total score of 37/40 (9/9/10/9). Fire Emblem Echoes was the top-selling game on its first week of sales in Japan, with 131,668 total units (including the limited editions), selling through 80% of its initial shipment. In the United Kingdom, the game debuted as the fifth best-selling game on the week of its release. 1.1 June 20, 2017 28 blocks Fixes a presentation bug with the fourth DLC pack, gameplay adjustments. Like the previous two games, Fire Emblem Echoes has received both free and paid downloadable content. The contents can be purchased individually, as a set of five packs, or as a singular season pass that unlocks all content at release. Fledgling Warriors Pack (JP: April 20, 2017 | WW: May 19, 2017) - Includes The Astral Temple dungeon and the Wretches and Riches and Band of Bandages maps. Undaunted Heroes Pack (JP: May 2, 2017 | WW: May 25, 2017) - Includes The Inner Sanctum dungeon and the Wealth Before Health and Lords of the Grave maps. Lost Altars Pack (JP: May 24, 2017 | WW: May 25, 2017) - Includes a set of ten dungeons that reward players with additional class options. Rise of the Deliverance Pack (JP: May 24, 2017 | WW: June 1, 2017) - Includes the Battle of Zofia Harbor, Outpost Rescue, Flight from the Ruins, and Seige of Zofia Castle maps. Cipher Companions Pack (WW: June 22, 2017) - Includes Chipher Legends I and Chipher Legends II, a pair of battle maps featuring exclusive characters from the Fire Emblem 0 trading card game. ↑ 1.0 1.1 1.2 1.3 1.4 Fire Emblem Direct 1.18.2017. Nintendo (YouTube; January 18, 2017). Retrieved January 18, 2017. ↑ 2.0 2.1 ファイアーエムブレム Direct 2017.1.19 プレゼンテーション映像. Nintendo 公式チャンネル (YouTube; January 18, 2017). Retrieved January 18, 2017. ↑ "#FireEmblem Echoes: Shadows of Valentia arrives on Nintendo #3DS on May 19th!" Nintendo UK on Twitter (January 18, 2017). Retrieved January 18, 2017. ↑ "#FireEmblem Echoes: Shadows of Valentia arrives on Nintendo #3DS on May 20th!" Nintendo AU NZ on Twitter (January 18, 2017). Retrieved January 18, 2017. ↑ Press Release from Nintendo of Korea (June 5, 2017). Retrieved June 5, 2017. ↑ Japan getting Fire Emblem Echoes: Shadows of Valentia special editions. Nintendo Everything (January 18, 2017). Retrieved January 18, 2017. ↑ Limited edition bundle on the way for Fire Emblem Echoes: Shadows of Valentia. Nintendo (March 21, 2017). Retrieved March 21, 2017. ↑ 8.0 8.1 The fate of Valentia is in your hands in Fire Emblem Echoes: Shadows of Valentia, coming to Nintendo 3DS family systems on May 19th. Nintendo UK (March 21, 2017). Retrieved March 21, 2017. ↑ 9.0 9.1 9.2 9.3 9.4 Fire Emblem Echoes: Shadows of Valentia – Two Armies. Nintendo (YouTube; March 21, 2017). Retrieved March 27, 2017. ↑ Fire Emblem Echoes: Shadows of Valentia Takes a Calculated Risk by Revamping the Strategy RPG. IGN (April 25, 2017). Retrieved April 30, 2017. ↑ 11.0 11.1 Schooled by Old-School Combat. Nintendo Treehouse Log (May 9, 2017). Retrieved May 9, 2017. ↑ Echoes: “Two Armies” Trailer Analysis. Serenes Forest (March 22, 2017). Retrieved March 27, 2017. ↑ 14.0 14.1 14.2 14.3 14.4 14.5 14.6 14.7 14.8 14.9 Fire Emblem Echoes: Dengeki Developer Interview (April 2017). Kantopia (April 27, 2017). Retrieved April 27, 2017. 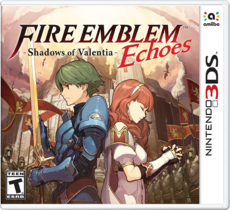 ↑ 15.0 15.1 15.2 How Fire Emblem Echoes: Shadows of Valentia Modernized a Forgotten 8-bit Strategy Classic for the 3DS. USGamer (May 31, 2017). Retrieved June 1, 2017. ↑ John Ricciardi 決算地獄‏ on Twitter (March 25, 2017). Retrieved March 25, 2017. ↑ 17.0 17.1 Famitsu Review Scores: Issue 1480. Gematsu (April 11, 2013). Retrieved April 11, 2017. ↑ 「ファイアーエムブレム Echoes」13万1000本，「ファミスタ クライマックス」4万8000本の「ゲームソフト週間販売ランキング＋」. 4Gamer (April 26, 2017). Retrieved April 27, 2017. ↑ 【週間ソフト販売ランキング TOP50】3DS『FE エコーズ』が14.3万本で1位（4月17日～23日）. Dengeki Online (April 27, 2017). Retrieved May 22, 2017. ↑ UK: Fire Emblem Echoes Enters Charts At Number Five. My Nintendo News (May 22, 2017). Retrieved May 22, 2017. ↑ 21.0 21.1 21.2 21.3 21.4 Fire Emblem Echoes: Shadows of Valentia – DLC Briefing. Nintendo (May 3, 2017). Retrieved May 3, 2017. ↑ 22.0 22.1 22.2 Fire Emblem Echoes: details and screens for Series 2 and 3 of the DLC; English footage. Perfectly Nintendo (May 3, 2017). Retrieved May 3, 2017. ↑ Fire Emblem Echoes: Shadows of Valentia DLC 2 & 3 detailed. Nintendo Power (May 3, 2017). Retrieved May 3, 2017. ↑ Fire Emblem 0: Fire Emblem Echoes DLC detailed and showcased, Series 11 announced, more. Perfectly Nintendo (May 13, 2017). Retrieved May 19, 2017. ↑ Expand your adventure with new downloadable content for Fire Emblem Echoes: Shadows of Valentia from 19th May. Nintendo.co.uk (May 3, 2017). Retrieved May 3, 2017. ↑ Fire Emblem Echoes: DLC schedule and pricing for Europe / North America; official website and videos. Perfectly Nintendo (May 19, 2017). Retrieved May 19, 2017.